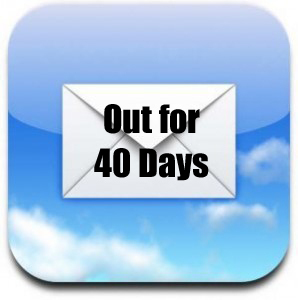 I spend on average between 2.5 to 4 hours a day on email. When I say “on” email that means reading it, replying to it, checking it on my phone, checking it on my iPad, deleting, archiving, sorting etc. The actual tasks that come to me via email may actually be less than the amount of time I’m on it. While communication is important, I’m hopeful that with alternate forms (chat, phone call, tweet, etc) of communication, I’ll be saving time in my day to work on other tasks and more meaningful projects. One other negative about always checking email is that I’m spending time either on my computer (at work) or on my phone (at home) rather than actually communicating with people or my kids face-to-face. I’m hoping that by freeing up this time, I’ll be able to spend more time on campuses talking to people and less time in my office alone. I’ll be tracking data on increases in human interactions, increased connections via social platforms, and time spent working on meaningful projects. Since I don’t have unlimited text messages and I don’t want my personal cell number going out to the world, I’m using the Google voice app to gather voice messages and texts. 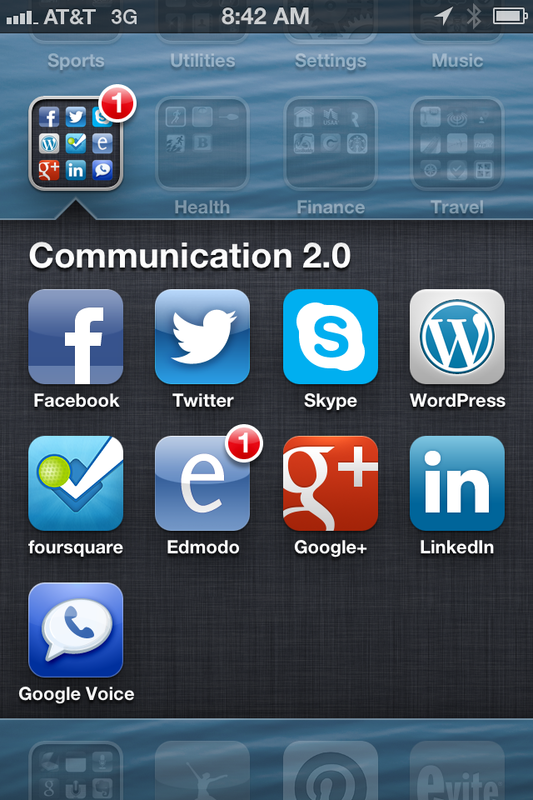 Besides the auto-response, I’ve also rearranged the apps on my phone into a folder called “Communication 2.0” in hopes of having all my messages go there. The main challenges lie with my peers. Email has become the easiest tool for many of us, so learning a new way to reach out to someone will be frustrating for some. I’m fully aware that many of the administrators in my building and at other districts use email as the primary and sometimes only form of communication. 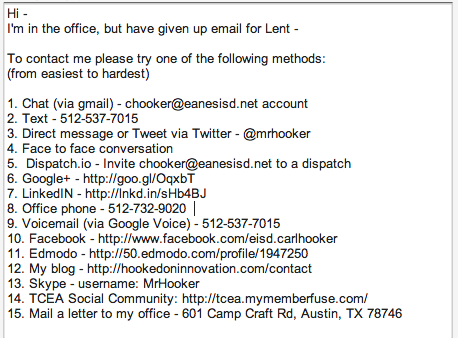 That might get me in some hot water as this challenge goes along, but that’s also why I tied it into Lent. After all, I can’t get fired for religious reasons right? I’m starting an #emailLess page on this blog where I’ll post updates every so often. I’ll also be tweeting to the hashtag #emailLessLent as I encounter challenges, interesting stories, and hopefully, some positive outcomes.